Are you someone who just can’t resist snacking throughout the day? Looking for some different ingredients to spice up your home cooking? How would you like to try some new products that you might not have otherwise found or purchased at your local grocery store? Well, if all of that sounds good to you, you might want to try out Degustabox. 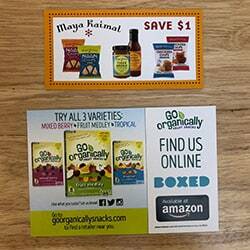 It’s a monthly subscription service that sends you nine to 14 full-size products in every box. For the most part, you’ll find snack items in your box, but there may be a couple other surprises as well. But what’s different about this box is that it’s not a specialty subscription like SnackCrate or MunchPak. Other monthly subscriptions that send snacks or random kitchen ingredients are typically focused on items from around the world or even something more artisanal. These are general items that you can probably find at one of the local grocery stores near you, which means they’ll be easy to repurchase if you find something you loved. Whether you’re feeling a bit bored with your usual grocery store purchases or you just want the convenience of monthly deliveries, Degustabox could be a great service for you to consider. 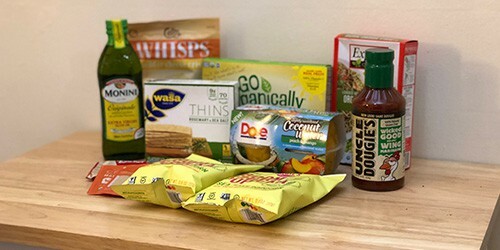 In this review, we’re sharing how you can order your first box, the types of snacks and products you can find inside, and more! Getting started with Degustabox is simple. Unlike many other subscription services that have a wide array of options to choose from, they only have one. This makes your choice pretty easy. So, all you need to do is add it to your shopping cart on their site and start checking out. There’s only a handful of steps to complete before your box paid for. In total, it took us about 5 minutes to checkout. The total value of our January 2018 Degustabox was $39.31. However, we only paid $19.99. At this time, orders can only be shipped to residents of the contiguous United States. That means they are unable to ship to Alaska, Hawaii, Puerto Rico, the US Virgin Islands, Guam, American Samoa, Federated States of Micronesia, Marshall Islands, Northern Mariana Islands, and Palau. When you receive your first order from Degustabox all depends on when you signed up for their service. If you sign-up before the 19th, you should expect to receive your box by the 5th of the following month. If you sign-up between the 19th and 25th, your order should arrive by the 10th of the following month. And if you sign-up between the 26th and the last day of the month, you can expect your order to arrive by the 15th of the following month. You’ll want to keep this in mind, as your order will not ship out and arrive right away. You will be provided with tracking information as soon as your order ships, so you can always keep track of it. What’s even better is that you don’t have to be home to accept the delivery either. No signature is required, so it will be left at your front door. If at any time you decide you’d like to cancel your subscription, you can contact Degustabox to do so. You just need to make sure you contact them prior to the 15th of the month. If you wait until after that, you will be locked in for another box. Nothing inside your Degustabox needs to be kept cold during transportation. That means there’s no need for insulated coolers, dry ice, ice packs, or any of that. All of your goodies will arrive in a standard cardboard box, which can be recycled after you are done with it. There’s no additional packaging except what the individual items themselves come in, so there’s no other waste to worry about. You’ll also find a print out of all the items included inside your box. This list contains a description of each item, as well as the pricing. It’ll allow you to see the value you’re getting with each order and how much you can expect to pay if you decide to purchase something yourself at the store. This is definitely a huge plus if you’d like to learn more about the items you received. A nice added bonus that Degustabox sends with all boxes are coupons for you to save if you decide to purchase the snacks in your box again. This isn’t something that we’ve seen in many other snack boxes. The items in your box will be fresh and sealed. Nothing has been opened, nor will it be nearing its expiration. That means you can consume it right away or save it for a later day. It’s completely up to you! If on the off chance you receive an item that is in poor condition, you can contact Degustabox to let them know about the issue. They’ll send you a new product in your next box to make up for the mishap. We taste-tested everything that came in our box and the results were positive but also a bit mixed. Our favorites were the Boomchickapop, Loacker, and Go Organically. The Go Organically fruit snacks were actually the best snack in the box. They taste just like regular fruit snacks. The ones that weren’t as good were the Explore Cuisine pasta and Cello Whisps. At first we liked the Cello Whisps but it had a weird after-taste. We weren’t prepared to use the olive oil and buffalo marinade so we didn’t really have a chance to “taste” them on anything. Since there’s only one box available, there aren’t multiple options to choose from or various prices to overwhelm you. You’ll simply pay a flat fee of $19.99 per month for as long as your subscription is active. Since you can cancel at any time, you never have to feel like you’re locked into the subscription either. You can continue receiving Degustabox for as long as you are happy with it. You can also start racking up Degusta points by referring your friends to the monthly service. When you refer someone, you’ll receive 50 points and your friend will get $10 off their first box. Once you’ve gotten 100 points, you can receive a free box! It’s all the more reason to spread the love and start recommending Degustabox to your friends. If you’re someone who doesn’t mind not knowing what you’re getting, Degustabox is a decent “snack of the month” subscription to sign-up for. It’s really ideal for someone who is open to trying new things, as someone with a picky palate might not be too happy with the selections every month. Do keep in mind that they will send you more than just snacks. Sometimes you’ll receive items like olive oil and pasta. Not that this is a bad thing but it definitely confused us when we opened the box. Another great feature about Degustabox is that they include coupons inside every box. That means if you find something you love, you’ll be able to repurchase it at your local store with the coupon they included. Have a question about Degustabox that we didn’t answer? Feel free to leave a comment below and we’ll get back to you as soon as possible!